We all have a celebrity that we admire, from their amazing voice, their acting abilities or the way they make it work on the runway. Whatever the reason, we all look up to them and see how beautiful they are on the covers of magazines and walking the red carpet. 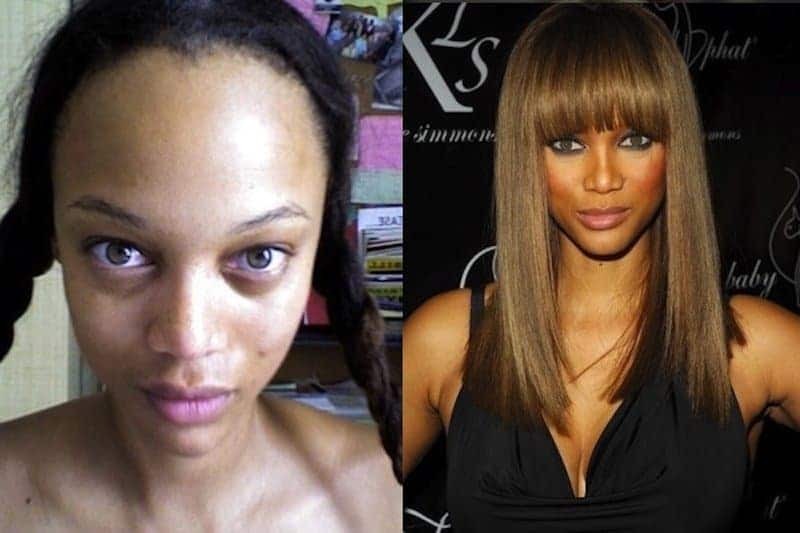 However, what do those celebrities look like when they aren’t covered in makeup? 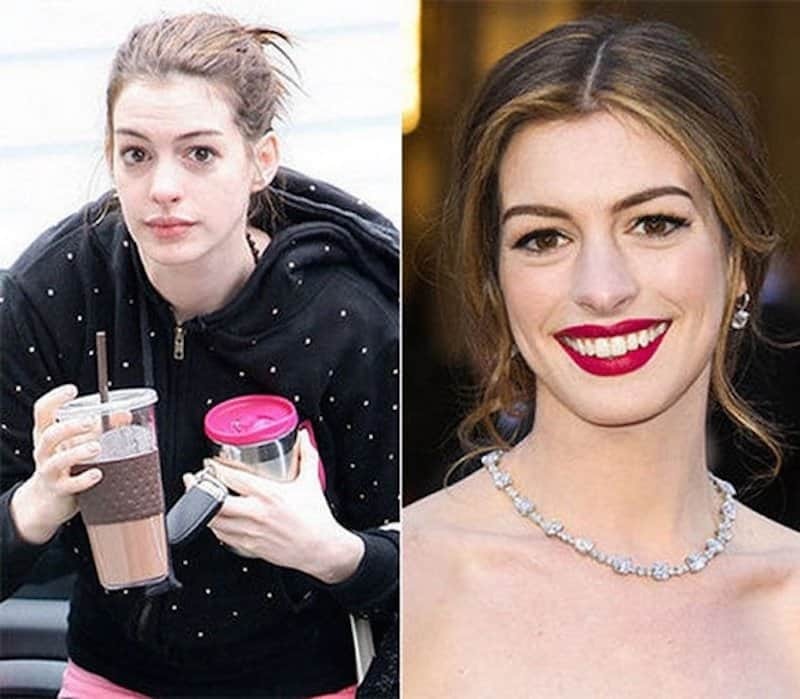 We have come up with a list of 20 celebrities without their makeup and some pass with flying colors, but then others are looking a little rough. The Oscar-winning actress looks gorgeous on the red carpet and on the big screen. Anne Hathaway also looks amazing while out doing errands with no makeup on. She has some great skin! 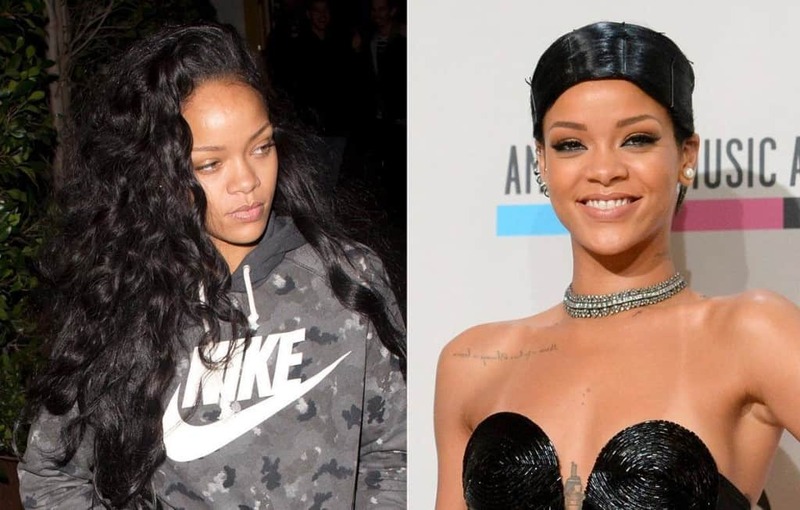 While Rihanna may be looking a little tired in the photo, she is still looking good with no makeup on. If you are pretty, it doesn’t matter if you go natural or put some makeup on it, your true beauty shines through. 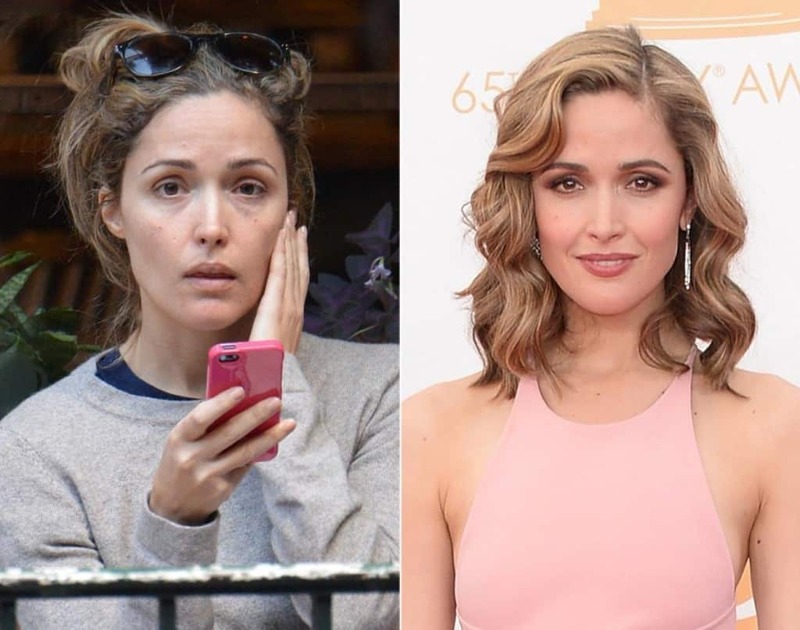 They joked about it on Bridesmaids and how pretty Rose Byrne was, but it looks like she is just as pretty without the makeup on. She is gorgeous in that red carpet photo, but she looks just as pretty going with the natural look. You can’t win them all, huh? 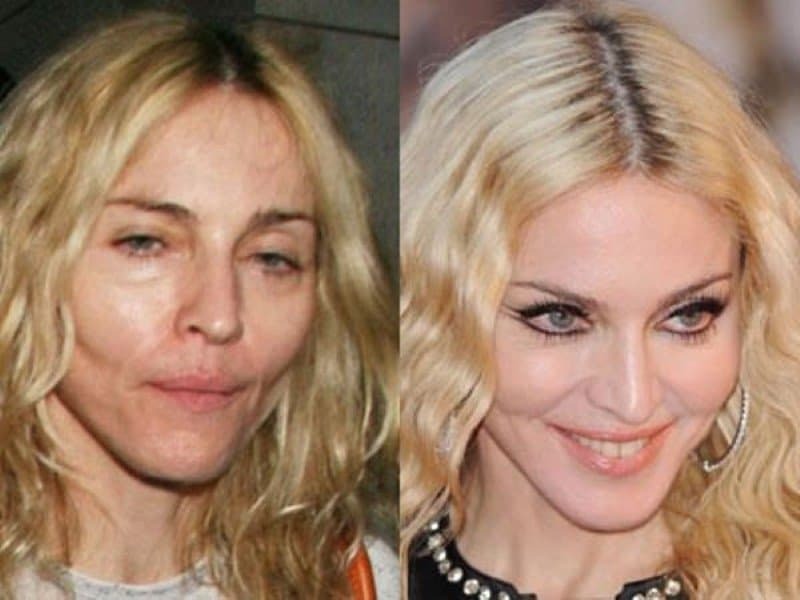 Madonna still looks good while walking the red carpet, but take that makeup off and she is definitely showing her age! That picture on the left is rough, but we are thinking it was a bad angle. Supermodel and Project Runway host Heidi Klum is a beautiful woman, so we are not shocked she looks good without makeup on. Heidi Klum can do no wrong, with or without makeup! The Twilight star seems like a simple girl and not into all the hoopla of movie premieres and red carpet events. She looks good when she gets all dolled up for those movie premieres, but no shocker that she looks good just walking around without any makeup on. Kate Upton is a beautiful woman and has all the curves working for her, but we all have those times when our skin breaks out. This is one of those times for her, but we are giving her the benefit of the doubt here. 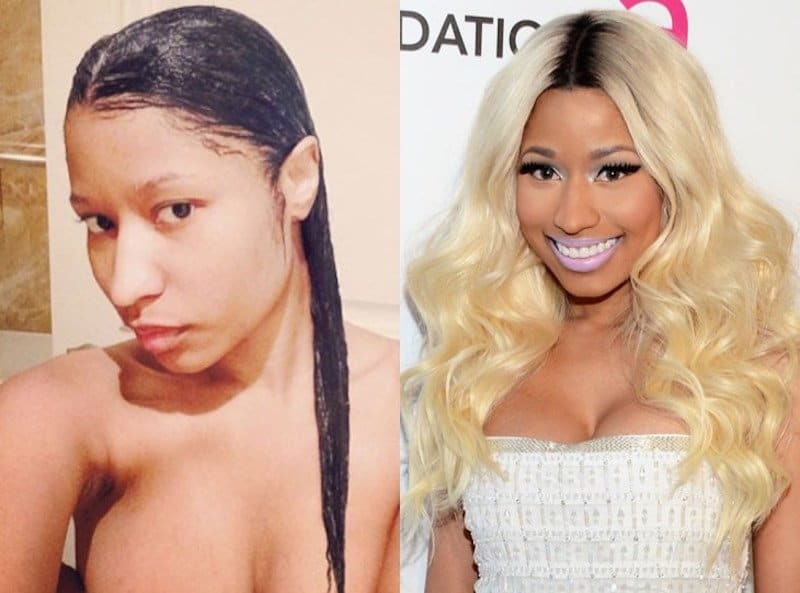 It is amazing to see that some people don’t change much whether they have makeup or not. 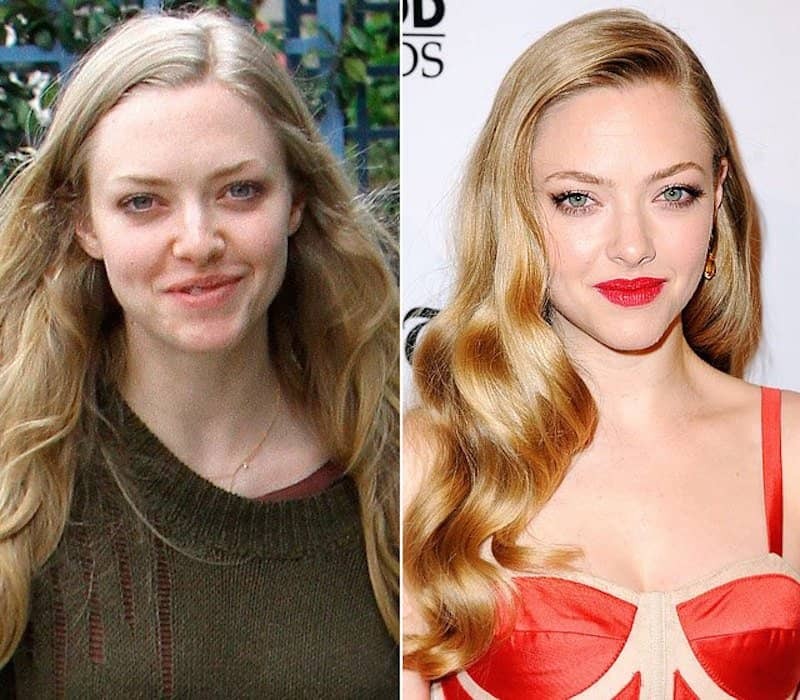 She does look a little tired around those eyes, but Amanda Seyfried is a busy actress, so it is allowed. We haven’t heard much from the High School Musical star lately, but she definitely knows how to rock the red carpet and rock some workout gear with glasses. She is beautiful in both photos. Tyra Banks is never one to hide anything, as she flaunted her body in a bathing suit when people were calling her bigger. Now she is sharing photos of her without any makeup on and while the skin is good, look at those eyes and we all know she has that forehead for days! The Friends star may be 46 years old, but she is not showing it, especially with no makeup on. 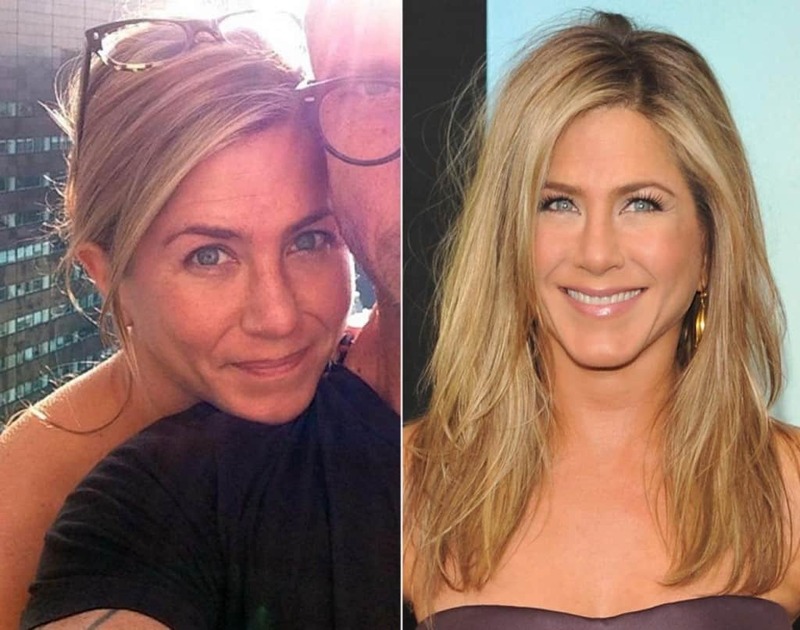 Without any makeup on, Jennifer Aniston looks like the girl next door and we love it. 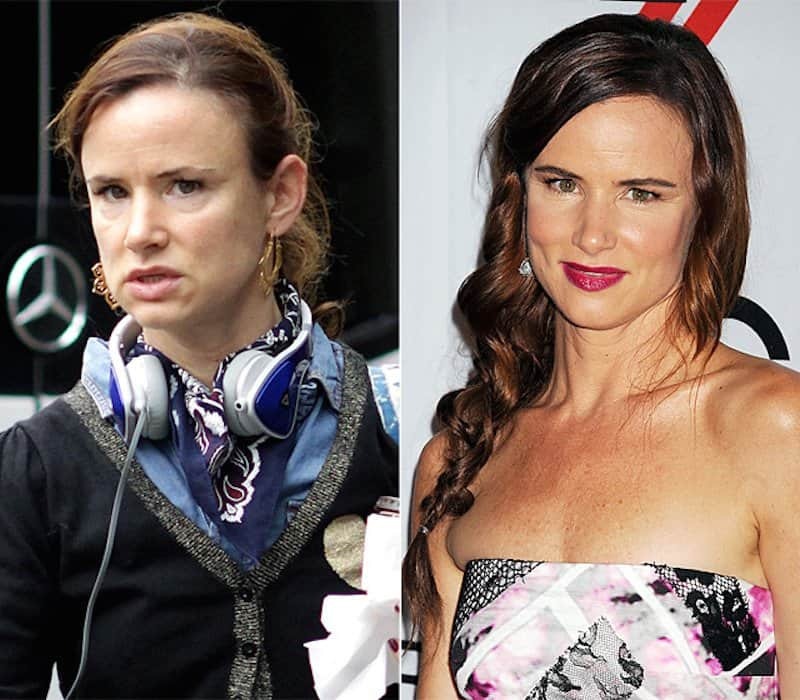 If you have been watching Secrets and Lies on ABC, Juliette Lewis does look a little rough but that is how the character is meant to look. In real life, she is rocking some pretty good skin in that natural look, especially for someone in their 40’s. Sometimes women wear way too much makeup, as if their face is that bad and they need to cover it up. Tori has too much makeup on in the right photo, especially when she doesn’t look half bad without makeup on. Being married to Tom Cruise can age a girl, as you can see with those eyes when Katie’s wearing no makeup. 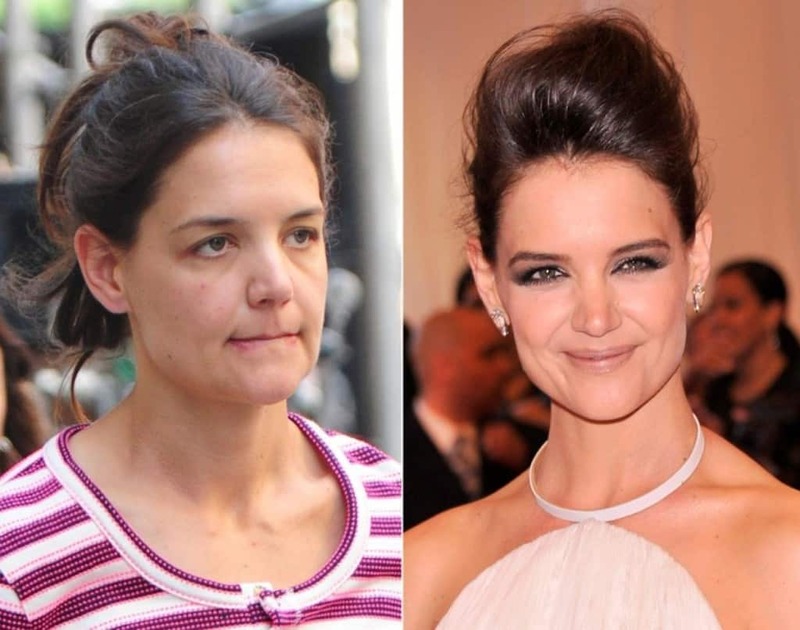 However, Katie Holmes does have some pretty good skin and would probably look better with a smile on that face! Jennifer Lawrence can do no wrong. The Hunger Games star looks flawless on the red carpet, regardless if she has long hair, short hair or even if she is photobombing someone. She has no makeup on and still looks beautiful and is a gorgeous woman. 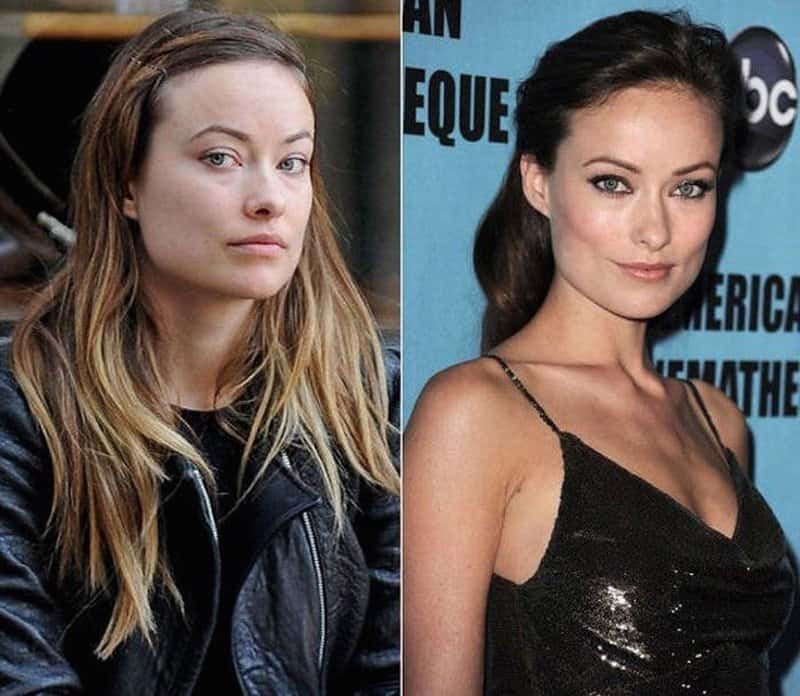 Olivia Wilde is one of those women that doesn’t need to apply much makeup to go from gorgeous to drop-dead gorgeous. She looks beautiful without any makeup on and after applying a little makeup, she can work the red carpet events. 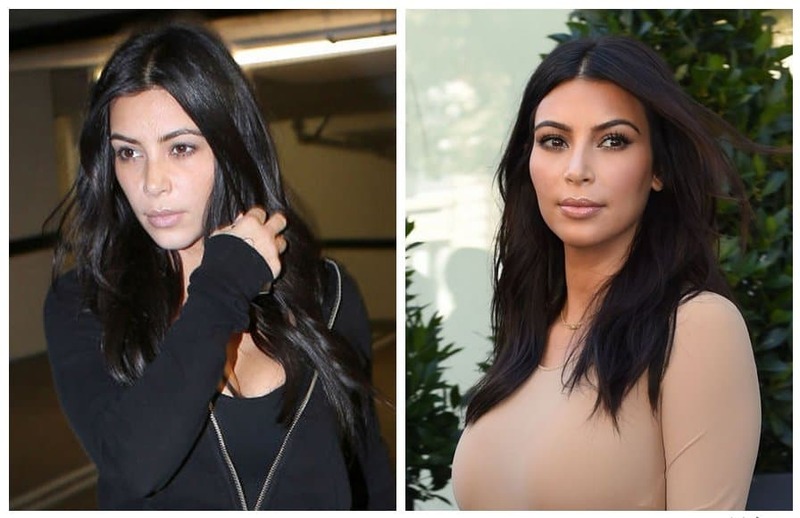 Kim Kardashian is one of those women that seems to put on 100 pounds of makeup before leaving the house. 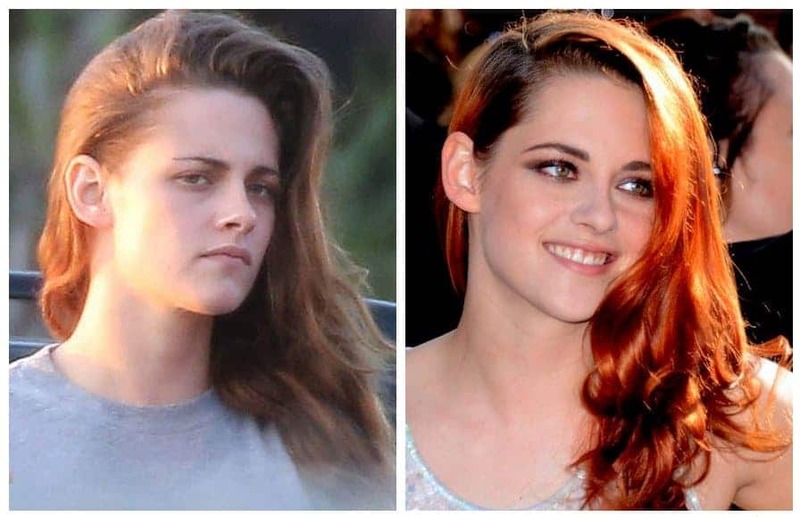 In some photos she looks rough without makeup on, but then looks fine without it on in others. This would be one of those photos where she looks fine, as Kim is making it work without makeup on. Taylor Swift looks good without makeup on, but she looks so young! 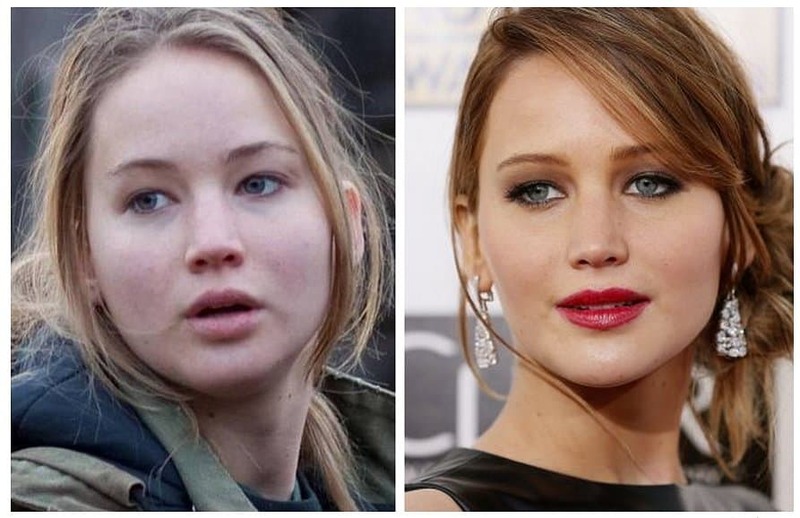 You put some makeup on her and it ages her so much, but not in a bad way. Either way, she is a very pretty girl. 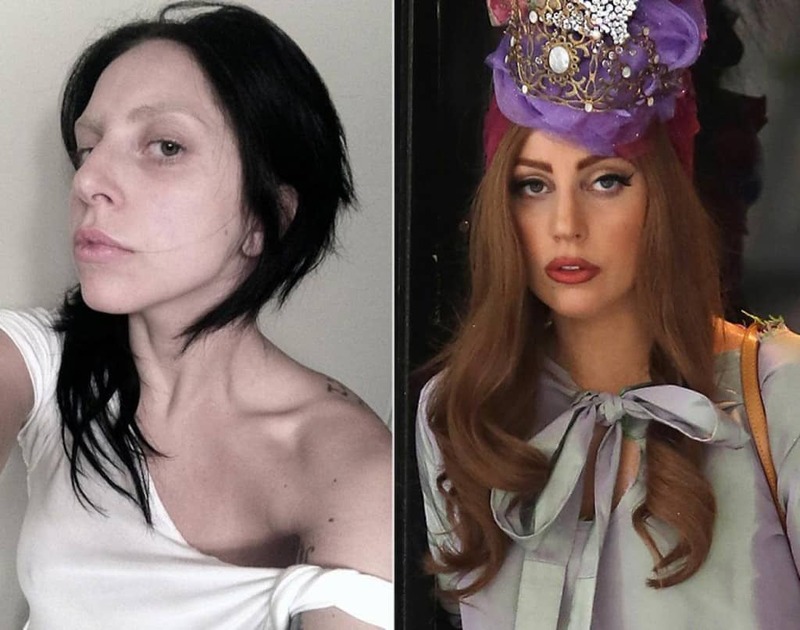 We all know that Lady Gaga goes over-the-top with her makeup and the different looks she brings out on the red carpet or at concerts. Underneath all of that craziness, it looks like a completely different person.